My very first magazine sale! I was just rummaging in old, old files and I came upon the magazine that I’m showing you, Profitable Hobbies. It was in its pages that I made my debut as a published writer! I was 24. Yes, I got paid $24 for 1,237 words. Google tells me that that $24 would be $213.20 in today’s money. What a bonus that was for my thin grad-student pocketbook. But what it did for my ego was beyond price. Profitable Hobbies was a monthly. You never heard of it. It died long ago. Its cover price was 35 cents. Its title says it all. Its 64 pages were chuck full about people who made money off their hobby. It was inspiring to read, and fun. The title of my article was “Photographing Tots.” How did that come about? I was taking a one-semester course, “Magazine Article Writing,” at Boston University. I was working for a master’s in journalism, and I got it in June. I planned to be a newspaperman, not a magazine writer, but this course was a must. We had to write an article and try to get it published. Then as now, magazine writing was intensely competitive. It was the same old story. Beginners were warned they’d collect a pile of rejection slips before they clicked with their first sale. My degree was in journalism, but we didn’t call ourselves journalists. We called ourselves “newspapermen” back then. There were a few women on newspaper staffs, but they did weddings and “society.” Now the accepted word is journalist. Women are as numerous as we and hold their own. And journalists now write, of course, for more than just newspapers. They also write, as we know, for magazines, TV, radio, and what is common, for so many online outlets. Blogs! I have a blog. You will read this as a post on my blog. Gosh, he was so fervent. “And remember the first rule of professional writing. Don’t just dash something off, put a stamp on it, and send it to some magazine you know little about while hoping for the best. One of the many kids I photographed–Dimitri Ganim, 5, son of Mr. and Mrs. George Ganim in my hometown, Pawtucket, R.I.
My article tells it all, too. “Photographing Tots.” It tells how I spent a summer vacation. taking pictures of kids in their homes as a little business. I had done that just the summer before. It was fresh in my mind. I took his advice. Wrote that article, then polished it and polished it, and sent it to the editor. I had never heard of “Profitable Hobbies.’. I located it in “Writer’s Markets” in the university library. That was the name of that big fat book, I believe. It seemed a perfect choice for me. And so it was. The issue had 64 pages. My piece was on Page 37. My byline was J.G. LaPlante. My very first byline! It wasn’t one of the major articles but it was a start. That was my big hobby, photography. Oh, for 10 years, and I had gotten darn good at it. Could develop and make my own prints. Those were the days, of course, of Kodak Plus-X roll film, Dektol developer, hypo, stainless steel tanks, all done in a darkroom—totally blacked out, under just a faint red lamp. I was so into photography that I had even built my own darkroom in a corner of my parents’ cellar. I developed that interest when my Uncle Jack, a GI who survived the thick of the action in France and Germany in World War II, came home with a souvenir for me. A German Voightlander camera. No idea how he acquired it. From a war prisoner, I suppose. It had a bellows. And took cut film, not roll film. The film was individual sheets, about 2 by 3.5 inches. You slipped each sheet into the back of the camera, snapped your picture, put in another sheet,snapped another picture. Then developed the sheets. Sounds clumsy and primitive, of course, and it was. Today you’d have to search in a photography museum to find that camera. And have lots of luck. But that’s how I plunged into all that. It seems incredible to me today. What hasn’t changed is how young people still follow the same path – developing career dreams and struggling to find the right niche in life. Yes, that dates way back to 1954 – 62 years ago! By the way, the lead article in that issue was “Winning Favor with Wrought Iron”–how the Watkinses of Fort Worth started a nice little business. The next big article was “Leaves of Clay”—how two South Dakota women made beautiful ceramic pieces with delicately-veined leaves imprinted into the clay.. Yes, after graduating I landed my dream job! Newspaperman. You know, covering news events and writing up their five W’s–the who, what where, when, and why of them although in many cases there was no knowing the why. Challenging work, and interesting. And journalists now write for more than just newspapers. They also write, as we know, for magazines, TV, radio, and what is common, for so many online outlets. And blogs! I have a blog. You will read this as a post on my blog. I started on a little weekly, then moved to another, then jumped to a major daily, the Worcester Telegram & Gazette in Central Massachusetts. It was one of the hundred biggest in the country. You may not know this but Worcester is a big, important city, second only in size to Boston in all New England. Yes, reporter to start. Then bureau chief, then a Sunday columnist as well. T then feature writer—my dream job. Feature stories are bigger stories, the kind often found as major stories in magazines. Feature stories cover more than the 5 W’s. They add a lot of background and explanation plus a thick frosting of human-interest detail. They require much more work, of course, because they go much deeper. I found that right up my alley. As it has turned out, over the years I’ve published countless feature stories. And I’m still writing them but nearly always now as blog posts. Keeping up with the times! Oh, if Professor Clayton could only see the unintended path that my career took. One instigated by him. (Thank you, Professor Clayton!) He would marvel at how that three-credit course of his opened a new window for me. And how I had taken it only because I had no choice. Flea markets are so much fun. Enjoying the sunshine outdoors. Going from dealer to dealer and searching through all that stuff hoping for a good find in all that junk. Chatting with this dealer and that one. Then, stumbling on a great find and scooping it up for just peanuts. Well, on this day I had not found anything. Then I came upon a dealer with old magazines on his table – piles of Life, Look, Readers Digest, (in its standard yellow cover, if you remember that), The Saturday Evening Post, National Geographic… and finally a thin pile of Profitable Hobbies. Wow! I didn’t want to show my excitement about that pile, so I casually glanced at Looks at Lifes and got finally to the small pile that excited me. Incredible! They were from 1953 and 1954! What are the odds for that? I looked through them. Some months were missing. 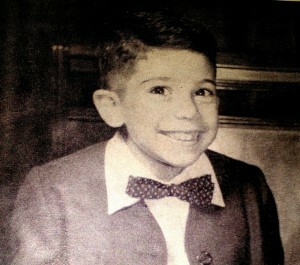 Then I found it–May 1954! I flipped through it. Sure enough, my “Photographing Tots!” There it was, on Page 37, and it jumped to the next page. I pretended to be calm. “How much?” I asked the dealer. He looked like a retiree doing this as a nice pastime. I flipped the magazine open and found my article, “This is interesting,” I said to him and pointednto it. And then I showed him my driver’s license. He didn’t understand. I pointed to the byline on the article and then my name on my license. I smiled. “Yep, maybe. I love flea markets. Just love them.” I smiled and started to move on, clutching my great find. He smiled, too. “I understand. Anyway, glad I made your day!” And gave me a wave. And now it’s more than 60 years since that course by Professor Clayton back at B.U. And I’m still writing the kinds of articles he was teaching us about. And beginning to believe I found my calling. Know what? I don’t think I ever let him know I made that extraordinary sale. I feel bad about that. I believe it would have made his day. At this time, you may have had enough about all this. 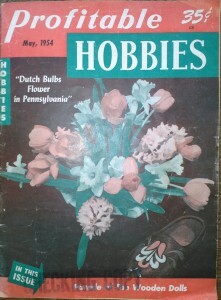 But if you’d like to see that full Profitable Hobbies article, I’m including it right below. It says a lot about me as well as those times – times that were so, so different from today. Last summer I went into business as a children’s photographer in Pawtucket, Rhode Island, to earn spending money in college. When school let out in June, I thought of going back to one of my former jobs. These had ranged from hospital attendant and Fuller Brush man to highway laborer and shoe salesman. But a certain optimism urged to me to try something on my own. The experience would bolster my self-confidence the way a chocolate bar helps, say, a guard during the third quarter. As I thought of this, the appeal grew so strong that I would toss about in bed stalking “The Idea.” Many possibilities, otherwise promising, were junked because of two restrictions. First, I had little capital; second, I had only the summer recess – three months – to succeed in. The time handicap was the tougher one. Many businesses could be launched with little money, but I would succeed within weeks only by capitalizing on whatever special experience I had. As I reviewed my background, I thought of my hobby. Photography fascinated me because it satisfied a creative urge. Why not photography? I had puttered around with cameras and filters long enough to be an advanced amateur. Though I had neither the talent nor gadgets of a highly skilled professional. I did have the basic equipment and the knowledge to do good work. It would be photography. Which field? Children, because parents are far more ready to have their offspring photographed than they are to have pictures made of themselves. To make money, I would have to do my own developing and enlarging. A dark room was a must, so I set out to build one. I completed it in four days, and the cost was $3.58 – the price of soldering a short lead pipe onto the outlet of a sink to take a garden hose. When I began, I could hardly tell the difference between a cross cut saw and a keyhole saw. I chose a corner of the cellar where the coal bin had been before we changed to oil. Building in a corner, all I needed were two walls and a door. After sweeping out the cobwebs and coal dust, I chalked off an area of 6 x 7 feet, small enough to be efficient. Then I rummaged for used lumber. I found some two by fours, which I used for the sole and uprights. Onto these I tacked salvaged fiberboard, patching the old holes with putty. The door was the problem – it had to be absolutely light proof. I tore up small curtains for an apron that I tacked onto the hinge side of the door. Then I edged the other three sides with strip felting made for insulation. Sealing the leaks was like sitting beneath an April sky and plucking out the stars one by one. Water was essential. My aunt donated an old sink, and I got a faucet we didn’t use from the garage. It was easy to tap a pipe and run an extension into the dark room. But a drain I was a harder problem. Breaking into a main would be too expensive. After much thought, I raised the bottom of the sink higher than a laundry tub in the next room, running a hose from the sink to the tub whenever I worked. Gravity emptied the sink. Raised to elbow height, he sink made examination of prints being washed much easier. About my equipment. I had German double-lensreflex camera–a Rolleicord- which was as versatile as a Boy Scout knife. I bought a used enlarger and a print driver for $50. Into a laundry case (the suitcase type) I stowed a tripod I already owned with two photoflood bulbs with rubber-jawed reflectors. The kit was easy to carry and adequate for my needs. All the preliminaries were done. To be in business, I needed only customers. I mapped a double approach: I would use the classified columns of the local newspaper to advertise, and I would canvass house to house until my ad became productive. I inserted the ad for a week, offering four different 8 x 10″ poses for $3.49. The offer, I felt, would be irresistible to any mother whose maternal instincts burned strong. Urging my mother to save an ear for the telephone, I was off to begin knocking on doors. This was familiar to me. As a former Fuller brush man, I knew many of the approaches and strategies. I knew it was good business to linger with the children in the yard for a few ingratiating moments before ringing the bell. It was wise to begin with a remark such as “My, but your children are big and strong, ma’am!” And I knew pressure was the tool of only a novice. I got eight orders the first day. Exultant, I went home eager to see how many the telephone had brought me. None. Not a nibble on the best offer in town. I felt like a spurned suitor. Repetition, I thought, would bring results. Comforted, I checked my equipment for the next day’s shooting. Children’s photography is tough. It is difficult to have a child pose naturally before a strange person, mysterious equipment, and blinding lights. He has to be reassured It’s fun, and his attention must be maintained. The “birdie” is as out of date as the dodo. It has been overworked. Something more compelling was needed. The attention-holder had to be good for boy and girl, infant, and 10-year-old. Candy is out. The makeup that results is offensive to mothers. But the classified ad! It worked as well as taking a picture in the dark. As the days passed without it bringing a single order, I wondered what was wrong. It was read, of course.. The weakness had to be in the wording of the offer. Studying the copy, I sense the cause. I raised the price to $5. It worked. I got customers. The trouble? The price had been so low that readers were suspicious. They feared a gimmick. Perhaps having to buy extra prints, frames, or colored photos. Raising the price increased the reader’s confidence in the ad. As sales increase, I learned to budget my darkroom time to the utmost. After each shooting day I would develop the day’s film. Thursday was E Day, when all enlarging was done. Thursday also being payday for many customers, I made my deliveries on Friday. A friend’s suggestion contained real genius. He proposed that I offer every customer 50 cents for the first lead that got me an order and.25 for each lead thereafter. It worked, and it wasn’t uncommon to find a woman lining up two or three friends for appointments. The business began to roll, and all of it was fun. At times I felt like another Engine Charlie. It was exciting to face a problem and work out a satisfactory solution. More than money. There was a challenge to revolve an idea and then make it crystallize. Every day was high adventure.